Darren Fresco is back on the stand. Nel has more questions for him. When they were driving to the Vaal River, where did Oscar keep his gun? Darren said between his legs on the seat, no holster. Nel also wants to know if Oscar ever asked Darren to slow down during that trip. Darren states no, he didn’t. He never complained about the speed. Then he asks Darren if he had taken any pictures of a speedometer that day and Darren says he took a picture of the speedometer when Oscar was driving to the Vaal. He was driving very fast, over the 250kph mark (150mph). As for the tickets that they received from the police that day, did Oscar offer to pay? He said no. In Tasha’s Restaurant, why did you pass your gun to accused? Darren says because Oscar asked to see it. There would have been no other reason to give it to him. And the gun did not fall out of his shorts. He only told that story to cover for Oscar. He was then asked if he had any contact with Samantha Taylor since the shooting on February 14, 2013. He states that he has not seen her since that date up until two days ago when he saw her in the witness room. Roux is up. He presents to the court a photograph of the speedometer that was taken at 16:41 (4:41pm) on the day of the Vaal trip and it’s a picture that Darren took of the speedometer while he was driving on the way home. He texted this picture to Oscar. Therefore, he states that Darren was lying when he said that Oscar was driving 150mph, it was actually Darren and he photographed himself doing that speed. Darren basically just says that he doesn’t remember that but if they have a picture then ok. The next witness up is Lt Colonel Vermeulen. His career in forensics started in 1992. 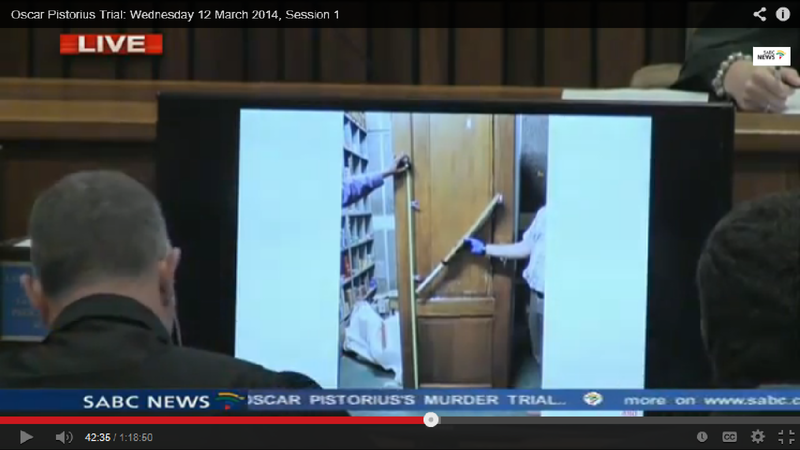 Vermeulen was sent to Oscar’s house to investigate on March 8, 2013, along with other experts. He was specifically requested to perform testing on the cricket bat and the toilet room door. He also was asked if he could ascertain the cause of the bending of the metal plate on the outside of the bathtub. When they arrived at Oscar’s house the door was not in the frame. The door was brought to the scene by one of the investigators and they attached it back to the doorframe and glued the broken out panels in to place. Vermeulen wants to clarify that on March 8th, his purpose for being there was to accustom himself to the scene. He did not do his own testing at the scene. He did it at a later time in the laboratory. On April 26, 2013, he received the metal plate from the bathroom tub and the cricket bat (both in sealed packages) from the forensics laboratory. He examined the metal plate first. His conclusion was that the plate became bent as a result of either being hit or something falling on it. It had to be a hard enough object to cause a scratch in the metal. The scratch was in a vertical direction. They were never able to ascertain the object that hit it. 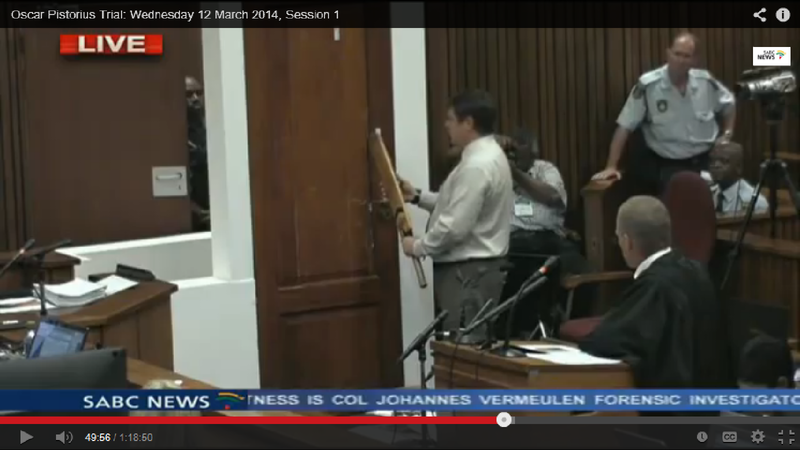 Vermeulen also had an opportunity to do testing on the door at the laboratory along with the cricket bat. The marks are located 1400-1530mm (approximately 5 feet) up from the ground. The investigation revealed that the cricket bat made a definitive match with the dent in the door. 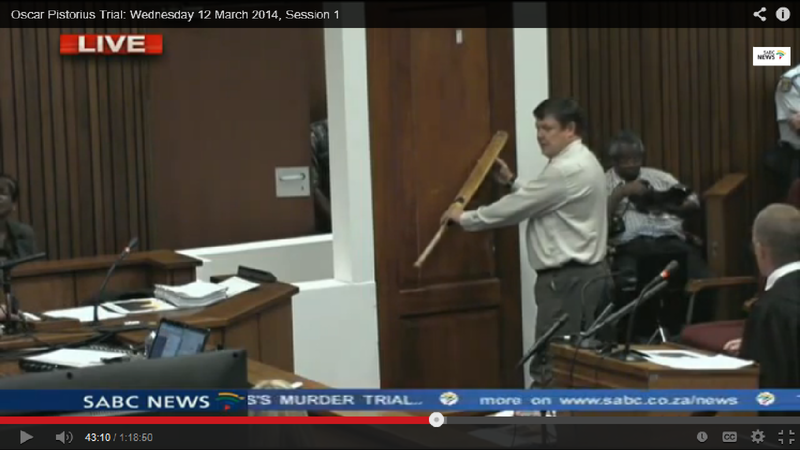 Vermeulen first demonstrates where the bat hit while standing. Looking at that image, you can see how he would most likely have to crouch to hit that spot. So he then demonstrates what it looks like to hit that spot from his knees (simulating being on stumps) and it was a very natural swing that hit that spot. 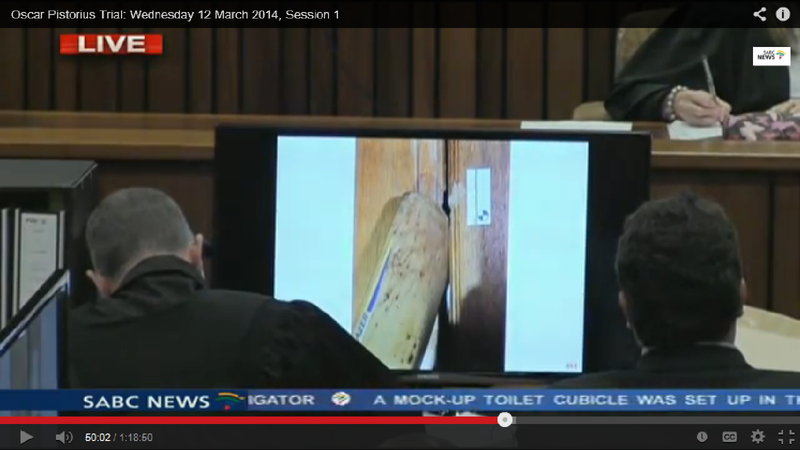 Vermeulen does not believe that Oscar was wearing prosthetics when he used the bat. He believes he was on stumps. 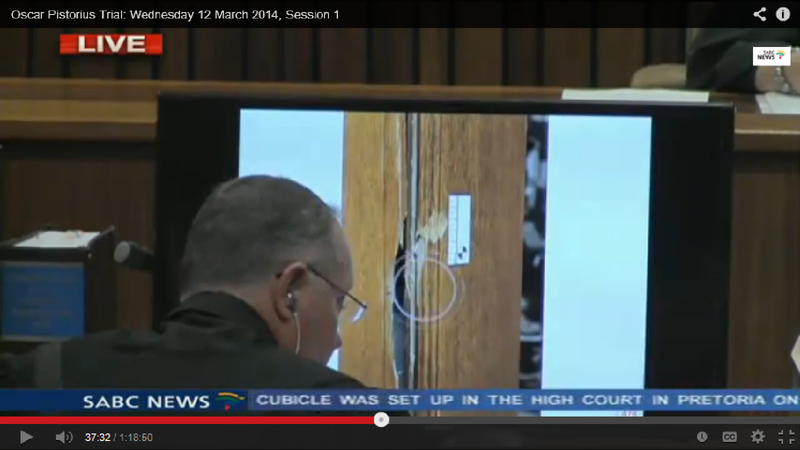 In Oscar’s testimony he states that after he shot Reeva (from his stumps) that he put on his prosthetics before he broke the door with the cricket bat. This is inconsistent with what the investigator is concluding. The next bat strike was right next to the other one but landed right on the edge of the door panel, and went thru the door. There are marks and coloration on the bat that support the bat went thru the door at that location. The bat was then twisted back and forth while in the door to break out the panel. Roux cross-examines. He wants to know if Vermeulen is a certified tool mark examiner. He states no, but the technique that he used was that of a physical match which is very similar to a tool mark examination. Roux asks him if he is of the opinion that Oscar was on his stumps at the time of the bullets being shot and Vermeulen testifies, yes, that he was there when ballistics tests were done, and he agrees that Oscar was on his stumps at the time of the shooting. Roux going back to the cricket bat again asks Vermeulen to get on his knees and lift his feet while he swings the bat and while Vermeulen does this, he is off balance. Roux wants to demonstrate that it would be difficult for Oscar to swing that bat while on stumps as he would not be able to adequately keep himself upright. Vermeulen counters that if he had enough balance to fire a gun while on stumps then he would likely have enough balance to hit the door with the bat on stumps. They now review the forensic evidence collection and storage procedures. 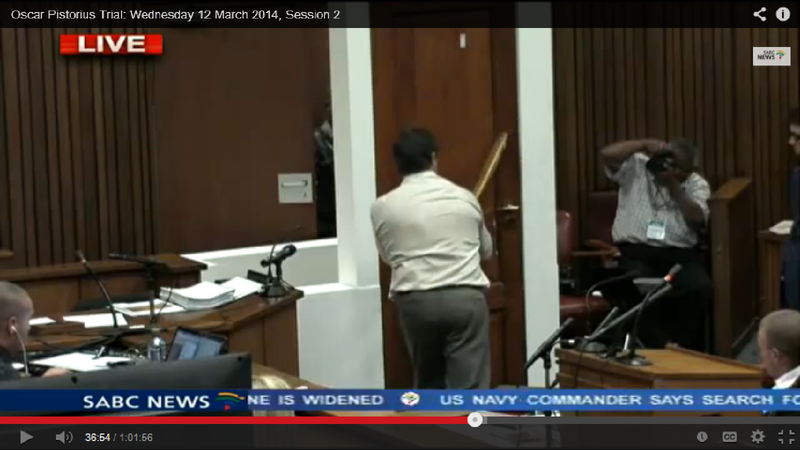 The rubber handle that was originally on the cricket bat is not on the bat in court, and Roux wants to know where it is. Vermeulen cannot testify to that. He received it from the laboratory without the rubber handle. He believes it was removed to be finger printed. It was then revealed that the investigator who had custody of the door from the date of the crime up until March 8 (when they brought it back to the scene) kept the door in his office. It was not properly wrapped for storage. Roux states that he has compared the door to the photos from the crime scene and there are now new marks on the door and he wants to identify where they came from. 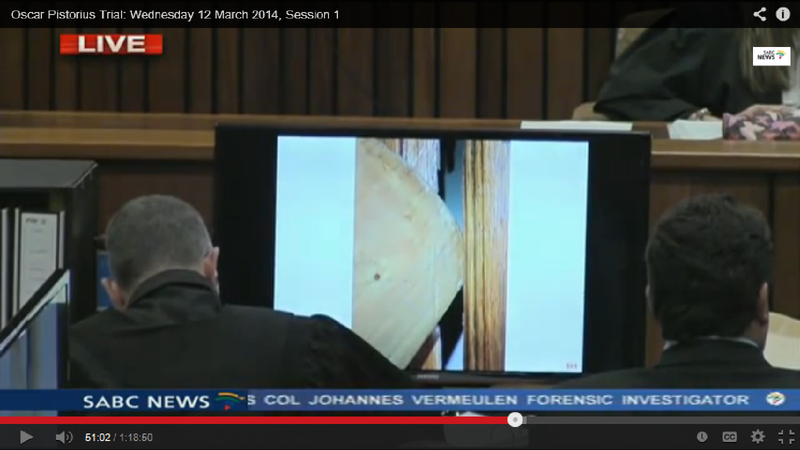 Vermeulen did not compare the door to crime scene photos when he examined and tested it. 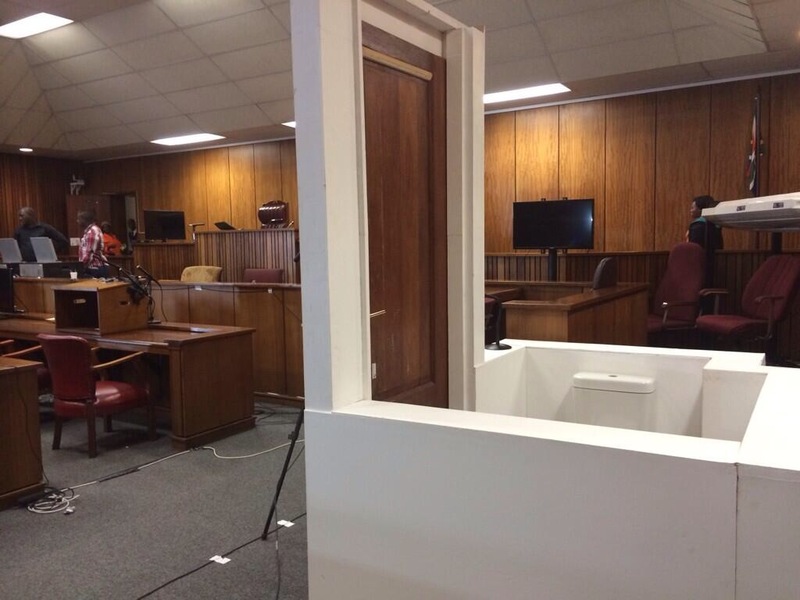 It is then pointed out by Roux that pieces of the door are missing and Vermeulen testifies that most likely pieces were left behind at the crime scene. Vermeulen states he wasn’t there at the crime scene when the door was collected so he cannot explain why pieces are missing. Roux wants to know if he ever asked anybody for the missing pieces and Vermeulen did not. It sure does seem like the handling of this door was not done well by the investigators and Roux is doing an excellent job at attacking their work. Roux now disputes that Oscar had to be on his stumps at the time of swinging the bat. Again, this point is important because Oscar’s statement says he was on his prosthetics. He has Vermeulen try out a few different stances so they can achieve the same mark on the door. Vermeulen states that he’s in an unnatural position when he hits it. He does not think that somebody would stand like this. Roux says it may be uncomfortable for him but perhaps it wasn’t an uncomfortable stance for Oscar. Vermeulen answers, “after the shots, or at least some part of it broke after the shots.” He came to this conclusion because one of the broken pieces of the door panel had a crack straight through a bullet hole. The way the crack ran through the hole would make it impossible for the shot to go through after. Roux now points out another mark on the door that is not a bullet shot or a cricket bat strike and he wants to know if they investigated it to see what caused it. Vermeulen says they noticed it but they did not investigate it. He was only asked to investigate the cricket bat marks. Vermeulen suggests that Oscar may have stepped on that panel when he was pulling Reeva out of the toilet room and moving through the bathroom. Roux states that they tested the wood and there are fibers from Oscar’s sock embedded in that wood. There is also door varnish on the prosthesis. He believes this will prove that Oscar used his prosthetics to try to knock the door down (prior to the cricket bat) as he stated in his affidavit. 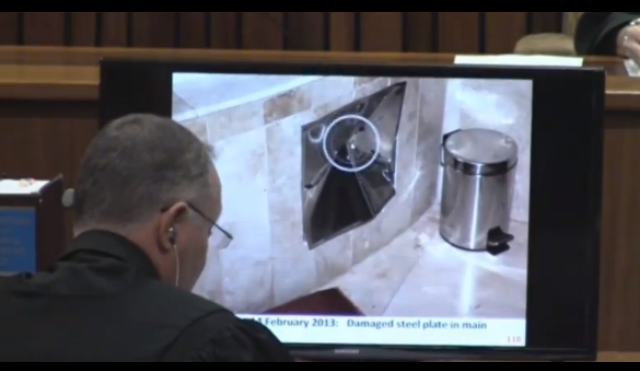 Vermeulen states again that it may be possible that there are traces of prosthetic on the door but he cannot prove when that would have happened in relation to all of the events. Roux seems pretty ticked that the police did not investigate the possibility that the prosthetic caused this mark, but Vermeulen states that his responsibility was to investigate the cricket bat. He had not reviewed Oscar’s statement prior to any testing so he did not know that Oscar claimed to use his prosthetic leg to kick in the door. I will say, just because the accused gives a statement, the police are not obligated to try to make his statement fit the crime scene. 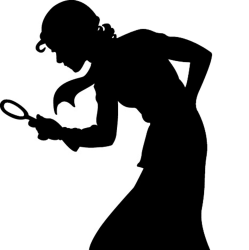 Their job is to investigate the crime scene to see what the evidence tells them. Not what the accused tells them. If the defense wants to introduce this theory, they need to do their own testing and bring it to trial, which they have done. I do get though why Roux is criticizing Vermeulen for this. It’s a good tactic for a jury trial. Jurors would likely think that is poor police work. But in this case, the Judge is deciding the verdict so I would think this particular argument is falling on deaf ears. She understands how investigators do their work. Back to the handling of the door again. Roux is really hammering this home. There are pieces that are missing from it while it is here in court today that were not missing before.. Roux would like to know what happened to those pieces. Also, there are pretty distinct marks just to the left of the door handle that were not on there on March 8. Vermeulen is really stumbling here. He can’t answer these questions. On these points, he is making the police work very sloppy. It’s unfortunate because this door is such an important piece of the story. He will be back on the stand tomorrow. 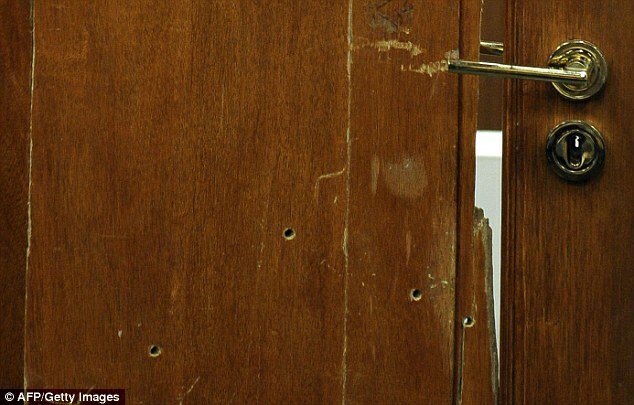 NOTE: the ballistics evidence for the four bullet holes that are seen in the door has not been introduced at trial yet. With the break hope catch up on quite a few missed testimonies, etc. and maybe work through some missed WS threads but they are so long and repetitive sometimes so not sure I’ll have the time, so thanks again for this well resumed site. Pity WS don’t have the same notification system as WP where you get flagged if someone replies to a comment you leave as I never know if people reply to me over there unless I read through the whole thread. Have a nice rest of Easter. Hi 🙂 I don’t believe that he shouldered or kicked that door. The shoulder thing was yet another manufactured detail that came up on cross-examination. Nobody had ever heard that before. And as for the kick, the “testing” that Dixon did to determine if the prosthetic leg ever kicked the door was laughable at best. I think Nel throwing in that little zinger that the door opens outward, not inward, was a little reminder to OP that he’s keeping track of these details and they do not add up. Good to know Nel picked the door opening outwards up and shows just how on the ball he is. I must have missed that bit… and I still haven’t been able to catch up!